Much is being made of the "the cloud." The money it will save. The agility it will bring to computing. What is less obvious is how IT departments are actively employing cloud services today. How they are reacting to both public and private cloud initiatives. What it will mean over the next couple of years for IT decision makers and implementers. To examine these questions, a study of IT professionals was conducted in North America and Europe to understand their perceptions and plans for cloud computing. 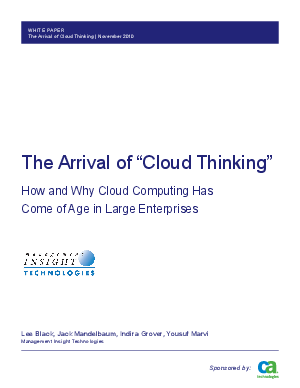 The study finds that enterprises are active in the cloud, and their virtualization efforts are contributing to broader "cloud thinking." As a result, the cloud is coming of age within large organizations and aligning IT decision makers and implementers around a cloud computing platform.